The launch was SpaceX’s first from the East Coast since a Falcon 9 exploded during a prelaunch test before the scheduled launch of Israel’s Amos 6 satellite last September. With Falcon 9’s regular pad at Cape Canaveral out of action while damage caused by the explosion is repaired, SpaceX turned to the nearby Kennedy Space Center, where they were already in the process of preparing a launch pad for future Falcon Heavy launches, manned Dragon missions and other launches in support of NASA. The Kennedy Space Center (KSC) is one of two launch sites on Florida’s Space Coast, along with Cape Canaveral Air Force Station which is adjacent to the South. Operated by NASA, Kennedy has been the home of America’s manned space program since the Apollo era. The site has a single launch complex, designated Complex 39 as part of a common numbering scheme with Cape Canaveral. The launch was SpaceX’s first from NASA’s Kennedy, lifting off from Launch Complex 39A (LC-39A) – a launch pad from which many milestone missions in the history of spaceflight – including Apollo 11 – were launched via the Saturn V rocket and later the Space Shuttle. The Falcon 9 launch was the first unmanned launch from LC-39A since the deployment of America’s first space station, Skylab, aboard a Saturn V rocket in 1973. Launch Complex 39 has historically consisted of two pads, A and B, with vehicle integration taking place in the Vehicle Assembly Building (VAB) 5.2 kilometers (3.2 miles) southwest of pad A. 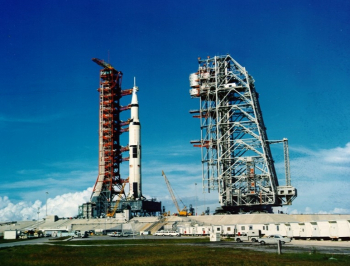 Following assembly, atop one of three Mobile Launcher Platforms (MLPs) – termed Mobile Launchers (MLs) during the Apollo program – rockets were transported to either pad A or B atop a Crawler Transporter, a large purpose-built tracked vehicle. NASA will continue to use this method of integration for the Space Launch System (SLS), which is due to begin operations from Launch Complex 39B no earlier than next year. However, SpaceX has adopted a horizontal integration method at pad A in keeping with the process already used in use at their other launch pads. 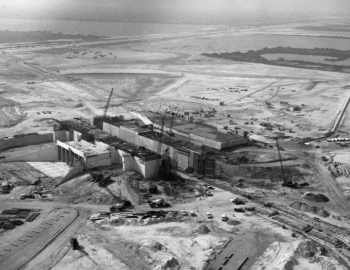 Construction of Launch Complex 39 began in 1963, while many details of the Apollo program had yet to be finalized. Designs called for three launch pads, designated A, B and C from north to south, with some plans including a notional fourth pad further to the North and possibly even a fifth. In the end, only two pads were built; 39B and 39C, with the latter redesignated Launch Complex 39A. 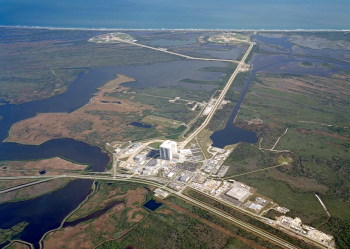 A stub off of the crawlerway connecting pad 39B to the VAB would have led to the original pad 39A. The first launch from the Kennedy Space Center, using LC-39A, took place on 9 November 1967 and also marked the maiden flight of the Saturn V rocket. The Apollo 4 mission demonstrated the Saturn V and conducted a test of the Apollo spacecraft in Earth orbit ending with a high-speed reentry to simulate the spacecraft returning from the Moon. Pad 39A was the prime launch pad for the Saturn V, used for all but one of its thirteen launches, including Apollo 8 which became the first manned mission to orbit the Moon in December 1968, and all six of the missions that landed on the Moon. 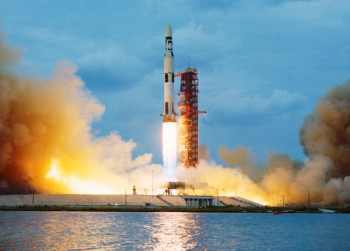 The only Apollo launch which did not use LC-39A was Apollo 10, which flew from Launch Complex 39B due to the short turnaround between the Apollo 9, 10 and 11 missions. On 16 July 1969, a Saturn V lifted off from Launch Complex 39A carrying astronauts Neil Armstrong, Edwin “Buzz” Aldrin and Michael Collins aboard the Apollo 11 spacecraft, which would become the first manned mission to land on the Moon. Six further manned Lunar missions flew from LC-39A, with five achieving successful landings. The sixth, Apollo 13, aborted its landing attempt after one of the spacecraft’s oxygen tanks ruptured, flying around the moon before returning the crew safely to the Earth. After the conclusion of Apollo’s lunar program, one further Saturn launch took place from pad 39A; in May 1973, the final flight of the Saturn V used a two-stage configuration to deploy NASA’s first space station, Skylab. 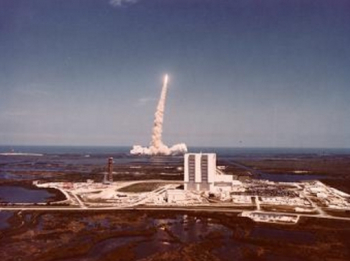 With Skylab in orbit, Launch Complex 39A began its transition to NASA’s next manned program, the Space Shuttle. Fixed and Rotating Service Structures were built at the pad to service the Shuttle stack, orbiter and her payload, replacing the Mobile Launcher-mounted Launch Umbilical Towers (LUTs) used by Saturn. The Mobile Launchers themselves, minus the towers, were retained for the Shuttle and redesignated Mobile Launcher Platforms. On 12 April 1981, the twentieth anniversary of Yuri Gagarin becoming the first man to fly in space, Space Shuttle Columbia lifted off on its maiden voyage, STS-1, from Pad 39A. Six months later – to the day – Columbia launched again from the same pad for STS-2, becoming the first spacecraft to be reused for a second orbital mission. 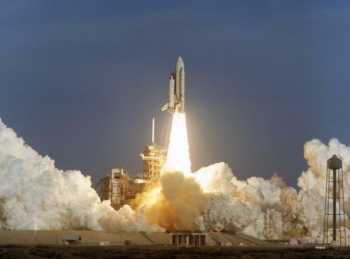 The Space Shuttle’s first twenty-four flights all launched from LC-39A between 1981 and January 1986, including the maiden voyages of all four original orbiters; Columbia, Challenger, Discovery and Atlantis. During this time, Challenger’s STS-7 mission carried Sally Ride – the first American woman in space, STS-8 carried Guion Bluford, the first African-American astronaut and Discovery’s STS-51G carried Sultan bin Salman Al Saud, the first Arab to fly in space. Bruce McCandless used the Manned Maneuvering Unit (MMU) to make the first untethered extravehicular activity (EVA) – or spacewalk – from Challenger during STS-41B, testing techniques for the first on-orbit repair of a satellite – Solar Max – which was accomplished during the next mission, STS-41C. The first Space Shuttle launch from Launch Complex 39B came on 28 January 1986 when Space Shuttle Challenger lifted off to begin the STS-51L mission. Seventy-three seconds later, Challenger and her crew were lost when the stack disintegrated; subsequent investigations traced the root cause of the failure to an o-ring in one of the solid rocket boosters not expanding, allowing exhaust gasses from the booster to burn through support struts and the External Tank. Shuttle missions resumed in September 1988. 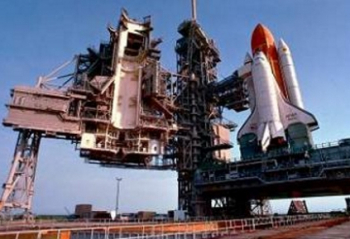 However, the next launch from pad A would not come until 1990’s STS-32 mission aboard Columbia. Through the 1990s Space Shuttles regularly departed from LC-39A, along with LC-39B, mostly flying scientific research missions. The fifth orbiter, Endeavour, made her first launch from pad 39A in April 1994 – her sixth flight overall. Launch Complex 39A was used for seven of the Shuttle’s nine dockings with Russia’s Mir space station, including the first mission – Atlantis’ STS-71 and the final mission, Discovery’s STS-91. Pad 39A was also the site of the first Shuttle launch during the construction of the International Space Station (ISS). In December 1998, Endeavour flew the STS-88 mission from the complex with the Unity module and the first two Pressurized Mating Adaptors, meeting up in orbit with the Zarya module which had launched aboard a Russian Proton a fortnight beforehand. It was from Launch Complex 39A that Space Shuttle Columbia launched in January 2003 for her STS-107 mission. A microgravity research mission making use of a SpaceHab double module in Columbia’s payload bay, STS-107 turned out to be the Shuttle’s final mission dedicated to scientific research. A piece of foam insulation from the External Tank detached during ascent and impacted the leading edge of Columbia’s wing. While not believed to be a threat at the time, the strike damaged Columbia’s heat shield and she disintegrated during reentry at the end of her mission, with the loss of all seven crew. When the Space Shuttle returned to flight in 2005, the program’s focus had shifted to completing the International Space Station – a task to which the Shuttle was uniquely suited – after which the orbiters would be retired in favor of a next-generation spacecraft, with Project Constellation and its Ares rockets later announced. 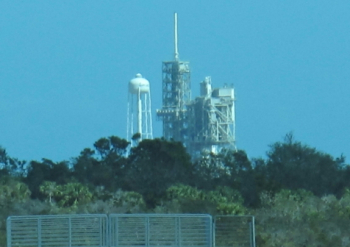 In December 2006 Discovery made the last launch from LC-39B – which was to begin conversion for Constellation ahead of 2009’s Ares I-X test flight – leaving LC-39A the Shuttle’s only remaining launch pad. 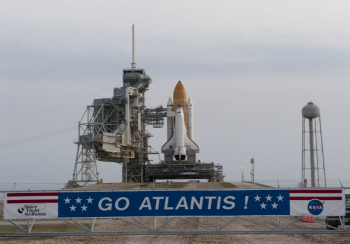 STS-117, flown by Atlantis in June 2007, was the first launch from Pad 39A since the Shuttle’s return to flight. A further seventeen missions flew from the complex until the end of the Shuttle program in July 2011, with all but one of these dedicated to the space station. The exception, STS-125, was flown by Atlantis in May 2009 and marked the Shuttle’s final mission to service the Hubble Space Telescope. The most recent launch from Launch Complex 39A was of Space Shuttle Atlantis on 8 June 2011, beginning the final flight of the Space Shuttle program, STS-135. The program concluded on 21 July with Atlantis’ landing back at the Kennedy Space Center’s Shuttle Landing Facility. The launch was the ninety-fifth from Launch Complex 39A, the 154th across both pads of Launch Complex 39 and the 155th from the Kennedy Space Center overall – the additional launch using an air-launched Pegasus rocket flying from the Shuttle Landing Facility. Pad 39A supported twelve times Saturn V launches and 82 Space Shuttle missions – including fifteen flights of Columbia, nine flights of Challenger, twenty-two for Discovery, twenty for Atlantis and sixteen for Endeavour. 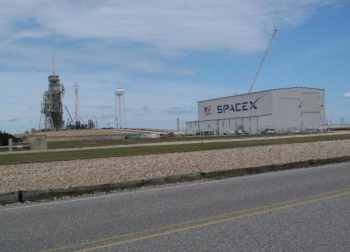 In 2014, NASA announced that it had signed an agreement with SpaceX to lease Launch Complex 39A for twenty years. 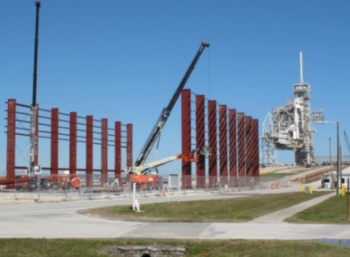 Over the three years that followed, parts of the former Space Shuttle pad have been disassembled, while SpaceX has constructed the necessary facilities to support Falcon 9 and Falcon Heavy operations at the complex including a large hangar at the base of the launch ramp. Rockets will be integrated horizontally in the hangar and erected at the launch pad via a Strongback, as they have been at SLC-40 and Vandenberg’s Space Launch Complex 4E, rather than using the complex’s historic Vehicle Assembly Building, Mobile Launcher Platforms and Crawler Transporters. The Falcon 9 rocket first flew in June 2010 and the launch marks its thirtieth flight. In its preceding twenty-nine launches, Falcon 9 has achieved twenty-seven successful launches, one partial failure and one outright failure. The partial failure came on the rocket’s fourth flight, when a first stage engine failed during ascent. Despite the malfunction, Falcon was able to deploy its primary payload, the CRS-1 Dragon mission, into its planned orbit however an Orbcomm satellite that was also aboard the rocket could not be deployed into the correct orbit and reentered the atmosphere a few days after launch. 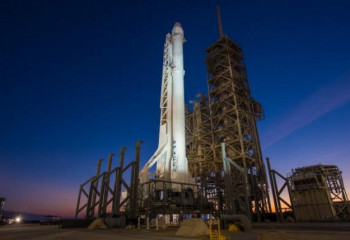 Falcon’s only launch failure to date came in June 2015, while attempting to deploy Dragon’s CRS-7 mission. Late in first stage flight, a cryogenic overwrapped pressure vessel (COPV) broke loose within the second stage oxidizer tank, overpressurizing the tank which caused its structural failure and the subsequent disintegration of the rocket. A second Falcon 9 was lost – along with the Amos 6 satellite – during a prelaunch static fire test in September 2016, however, this was not a launch failure as the rocket was still several days away from launch at the time of its explosion. That failure was also traced to a second stage COPV, which was found to have burst due to oxygen bubbles becoming trapped between its carbon outer casing and aluminum lining and subsequently solidifying. A two-stage vehicle, the Falcon 9 burns RP-1 kerosene propellant which is oxidized by liquid oxygen. Ten Merlin engines power the rocket; nine clustered at the base of the first stage with the tenth, a version optimized to operate in a vacuum, mounted on the second stage. The Dragon spacecraft sits at the top of the vehicle with a nosecone covering its berthing apparatus, but otherwise unencapsulated. Falcon is designed to be partially reusable, with SpaceX attempting to recover the first stage wherever possible. The first five launches used an early version of the rocket which has become retrospectively known as the Falcon 9 v1.0. This was shorter than its predecessors, with less powerful Merlin-1C engines arranged in a square grid pattern on the first stage. The first stage was equipped with parachutes but did not survive descent on any mission. From the sixth launch onwards this was replaced by the Falcon 9 v1.1, which stretched both the first and second stages, rearranged the nine first stage engines into an octagonal, or OctaWeb, pattern and introduced upgraded Merlin-1D engines. The Falcon 9 v1.1 allowed SpaceX to begin testing procedures for the rocket’s first stage to make a controlled, powered, landing onto a barge located downrange of the launch site. 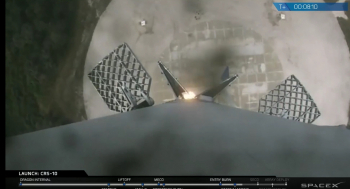 Three Falcon 9 v1.1 launches – CRS-5, CRS-6 and Jason-3 – attempted landings on SpaceX’s barges, or Autonomous Spaceport Drone Ships (ASDS), all of which reached the drone ships although none was able to achieve a stable landing. For missions to geosynchronous transfer orbit, the Falcon 9 v1.1 flew without landing legs and could not attempt a recovery as all of its performance was required to deliver the payload. In December 2015, a new configuration – described as the Falcon 9 v1.2 or Falcon 9 Full Thrust – was introduced. This introduced uprated engines, a further stretched second stage and densified supercold liquid oxygen oxidizer, increasing the rocket’s performance and allowing recovery attempts to be made on most launches – even those targeting geosynchronous transfer orbit. On missions that do not come close to requiring the rocket’s full performance, the v1.2 configuration allows the first stage to fly back to the launch site for a land-based recovery, which was demonstrated successfully on the configuration’s maiden flight. The landing at Cape Canaveral’s Landing Zone 1 – the former Launch Complex 13 – was the first time SpaceX successfully recovered the rocket’s first stage and the recovered booster has since been put on display outside SpaceX’s headquarters in Hawthorne, California. To date, SpaceX has achieved seven successful first stage landings – five at sea and two on land – from twelve attempts. 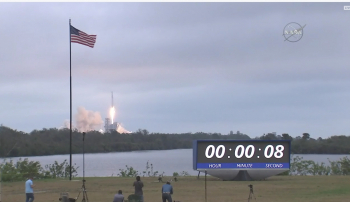 The launch was the thirteenth attempt, with the rocket successfully targeting a ground landing at Landing Zone 1 (LZ-1) of the Cape Canaveral Air Force Station. Originally built in the late 1950s as Launch Complex 13, the pad originally served Atlas missile test launches and later orbital missions with Atlas-Agena vehicles. The last launch from LC-13 occurred in April 1978, and the pad’s towers were demolished in 2005 after becoming unstable. The facility was leased to SpaceX in early 2015 and supported its first landing attempt at the end of the same year. Ahead of the launch, Falcon fired her engines for three and a half seconds on Sunday 12 February, completing a successful static fire test. The rocket was then taken down for payload integration before going vertical again on Friday evening. On launch day, the final stages of the countdown begin with a readiness poll seventy-eight minutes before launch, establishing that flight controllers are ready to proceed with fueling and launch. With a positive response, fueling of the rocket’s propellant tanks begin seventy minutes before liftoff, with liquid oxygen due to begin loading into the oxidizer tanks around twenty-five minutes later. As the countdown approaches its conclusion, final steps are undertaken to ready the rocket for launch. Seven minutes before liftoff, chilldown of the Falcon’s engines begin. Final clearance to launch is given by the US Air Force’s Range Control Officer (RCO) two minutes before launch and SpaceX’s own Launch Director (LD) half a minute later. The last minute of the countdown saw Falcon’s onboard computers perform final prelaunch checks and the rocket’s propellant tanks were pressurized. Saturday’s attempt proceeded to plan until caution over potential upstream root cause issues with out of family data from Upper Stage Thrust Vector Control (TVC) System resulted in a hold at T-13 seconds and a scrub for the day. Sunday’s count went to plan, with ignition of the first stage’s nine Merlin-1D engines occurring three seconds before liftoff, giving the rocket a short hold down time during which any anomaly in the engines’ performance would result in the launch being aborted. This launch involved the first “Throwback”, which was change to how the Transporter Erector performs during a launch. Falcon was released at the zero mark in the countdown, beginning its first mission out of the Kennedy Space Center. Flying downrange to the northeast, as the Space Shuttle did when it visited the space station, Falcon passed through the area of maximum dynamic pressure – or Max-Q – seventy-five seconds after launch. The first stage burned until two minutes and twenty-one seconds mission elapsed time, conserving propellant for its return to Cape Canaveral and landing attempt. Three seconds after first stage cutoff, stage separation took place with the second stage continuing towards orbit and the first stage beginning its descent. 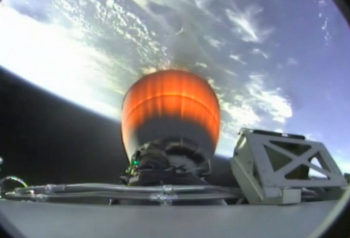 Second stage ignition took place eight seconds after staging, beginning a six-minute and 33-second burn that injected Dragon into low Earth orbit. 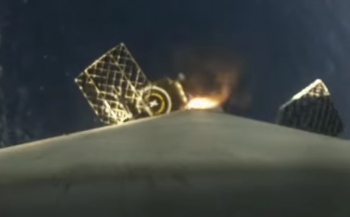 A minute after the end of the second stage burn, Dragon separated from the Falcon 9 to begin its mission, deploying its solar arrays fifty-five seconds later. The second stage will later make a second, disposal, burn. While the second stage was performing its first burn, the first stage made three more of its own. 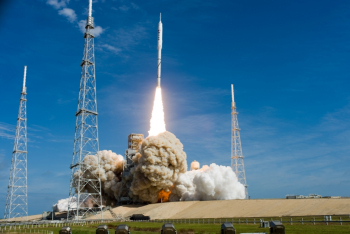 The first of these, a boostback burn, began twenty-three seconds after separation to arrest the vehicle’s downrange motion and put it on a course back towards Cape Canaveral. The second burn began at about six minutes, 32 seconds elapsed time to reduce the vehicle’s speed as it reenters the atmosphere. The third and final burn, beginning seven minutes and 33 seconds after launch, slowed the rocket as it approached the landing pad, providing a powered descent to touchdown. The payload for the launch is a Dragon spacecraft, flying the unmanned CRS-10 logistics mission to the International Space Station. SpaceX’s Dragon spacecraft is one of two commercial vehicles flying resupply missions to the International Space Station under NASA’s Commercial Resupply Services (CRS) program, alongside Orbital ATK’s Cygnus. 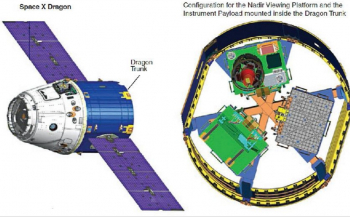 Since the retirement of the Space Shuttle, Dragon is the only spacecraft capable of carrying a significant amount of cargo that is designed to be recovered at the end of its mission. Russia’s Soyuz, the only other spacecraft that is recovered, is primarily geared towards crew transport and leaves little space for cargo downmass, while Cygnus, Russia’s Progress and Japan’s Kounotori or HTV are all designed to burn up in the atmosphere once they leave the station. Dragon consists of a pressurized capsule, which is recovered at the end of the mission, and an unpressurized trunk section which is not. Both sections can carry cargo, while the trunk also houses the spacecraft’s solar arrays. The mission is the twelfth flight of Dragon, and its eleventh mission to the International Space Station, including the CRS-7 mission which failed to achieve orbit. Following launch, Dragon will take two days to reach the ISS, performing a series of maneuvers as it chases the space station. Upon arrival at the outpost, Dragon will be grappled by the space station’s CanadArm2 robotic arm under the control of astronaut Thomas Pesquet, and berthed on the nadir port of the facility’s Harmony module via a Common Berthing Mechanism (CBM). 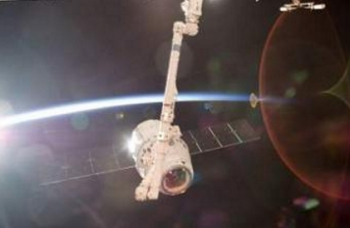 The day after its arrival, the ISS crew will enter Dragon and begin unloading cargo. Dragon is carrying a total 2,490 kilograms, or 5,490 pounds, of cargo. This includes 1,530 kilograms (3,373 lb) of pressurized cargo and 960 kg (2,116 lb) of unpressurized cargo in the Trunk. The pressurised cargo includes 732 kilograms (1,614 lb) of scientific hardware and experiments, 296 kilograms (653 lb) of provisions for the crew, 382 kilograms (842 lb) of hardware for the US segment of the station and 22 kilograms (49 lb) for the Russian segment, 11 kilograms (24 lb) of computer equipment and 10 kilograms of hardware to support extravehicular activity (EVA) at the station. One experiment NASA has highlighted among the science payloads being delivered to the space station will study the growth of a human monoclonal antibody in space, which scientists hope could help in the fight against diseases, particularly cancers and conditions that affect the immune system. Another experiment will observe the growth and development of stem cells in a microgravity environment. The unpressurized cargo includes NASA’s Stratospheric Aerosol and Gas Experiment III, or SAGE III-ISS. 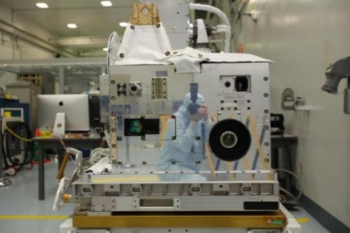 SAGE III-ISS will monitor ozone, aerosol and trace gas levels in Earth’s stratosphere, by observing the refraction of sunlight and moonlight through the atmosphere. The instrument, which will be mounted outside the space station, is the fourth to launch in the SAGE series: the first SAGE was launched aboard a dedicated satellite in 1979; SAGE II was launched aboard NASA’s Earth Radiation Budget Satellite (ERBS), which was deployed by Space Shuttle Challenger during the STS-41G mission that launched from LC-39A in October 1984, and a previous SAGE III instrument was flown aboard Russia’s Meteor-3M No.101 weather satellite in December 2001. A third SAGE III instrument has been built and is currently in storage. SAGE III ISS will be mounted to an ExPRESS Logistics Carrier (ELC) at the station, via an ExPRESS Pallet Adapter. A miniaturized inertial measurement unit and Hexapod Pointing System will be used to monitor fluctuations in the movement of the space station and correct the pointing of the sensor, keeping it aligned for observations. The Lightning Image Sensor (LIS), or STP-H5, is another unpressurized payload which will be mounted externally to the space station. The Lightning Image Sensor is expected to record and study lightning activity across the face of the Earth visible from the station. It provides a dedicated instrument to continue observations that have already begun using other instruments and equipment aboard the station. 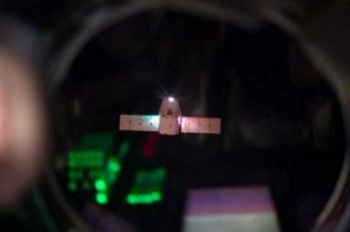 Dragon is expected to remain at the International Space Station for about four weeks. Towards the end of her stay, she will be loaded with equipment and experiments to be returned to Earth. The spacecraft will be unberthed and released using CanadArm2, before performing a deorbit burn and separating its Trunk section. The pressurized module will reenter the atmosphere before descending under parachute for recovery off the coast of California. The Trunk is expected to burn up in the atmosphere. The launch was the second of the year for SpaceX and its Falcon 9 rocket, following January’s successful return-to-flight mission that deployed ten Iridium-NeXT satellites into orbit from Vandenberg Air Force Base. Falcon’s next launch is currently scheduled for 28 February, with the EchoStar XXIII communications satellite. EchoStar was originally scheduled for launch ahead of Dragon. However, the missions swapped order at the end of January due to restrictions on available launch windows for the Dragon mission. The EchoStar launch will also use Launch Complex 39A. (Images: via SpaceX, NASA and L2).